McCormick was raised in rural Virginia, where his father was a farmer, blacksmith, and sometime inventor. 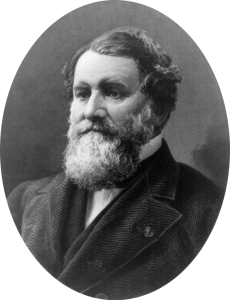 Cyrus McCormick had little formal education, but spent most of his time in his father’s workshop. In 1831, he began working on a mechanical reaper, and by 1834 had sufficiently perfected the horse-drawn device to secure a patent. The McCormick reaper revolutionized agriculture, accomplishing in a single hour what took 20 hours by hand labor. It made possible large-scale farming—and without slave labor. With John Deere’s “Grad Detour” plow, the reaper was instrumental in opening up the American West to agricultural settlement on a vast scale.